Here you will find a listing of our most popular classes and events! You can register and make payment for the classes listed below here on our site by placing the class in your shopping cart. For all other class or event inquiries, please send us a note using our contact page. Please put the class title in the subject line and include your name, email & phone number in your message. You can always register by phone at 614.382.8008 or in person at 365 S. Main Street Pataskala, OH. Your enrollment in a class is a commitment to our teachers, so PLEASE check class date(s) and your calendar carefully before registering. Class fees are non-refundable, but should you need to drop out of a class after registering, if we are notified at least 48 hours prior to class, we will gladly give you class credit toward another class. 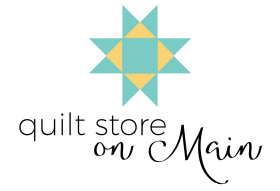 When signing up for a class, please be aware that the instructors are helping you to learn a technique/layout of a quilt and how to put blocks of a quilt together. For most classes, you will get a FEW blocks complete, NOT AN ENTIRE QUILT. Class credit balances are redeemable for 12 months. No exceptions. For any classes or special events requiring prepared store-cut kits, you will be responsible for the kit fee even if you miss the class. Registration for these classes is also considered registration for the associated kit(s). 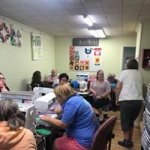 Our monthly Friday NIght Sewcial is a "sewcial" event to eat, fellowship and craft. A great way to meet new crafty people, this night is always a lot of laughs!